The final table also featured William Pappaconstantinou, a.k.a. Billy Pappas, a former world champion foosball player, who finished fifth. Jacobson has reached three other WSOP final tables, two WPT final tables, and four EPT final tables. 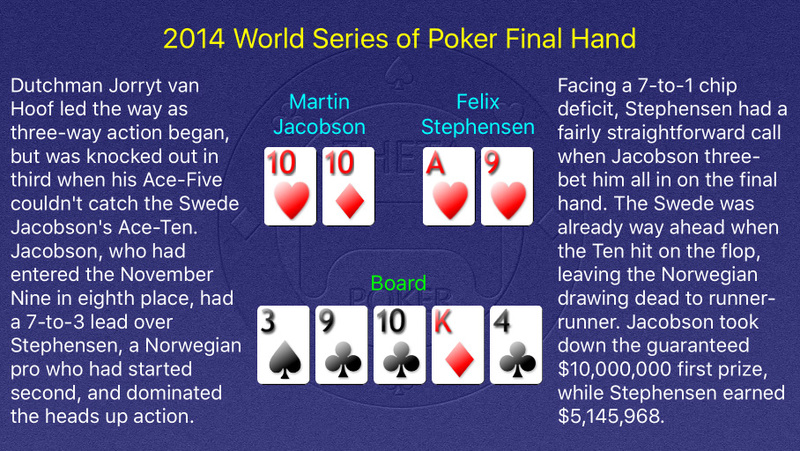 Stephensen won his Main Event buyin on a $1,000 World Cup soccer bet when the Netherlands beat Australia by the exact score of 3-2 on June 18, 2014 to win him $60,000, less than three weeks before the WSOP Main Event began.